Before you get excited, this is not a normal recipe post. 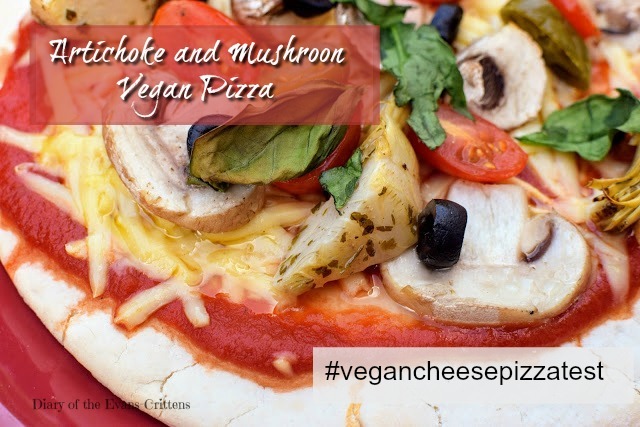 I’m often asked what is the best vegan cheese for making pizza, and the truth is at the moment I’m still experimenting with different dairy free cheeses (in other words just using which ever vegan cheese we happen to have in the fridge when we happen to fancy pizza). While making pizza last night I used Tesco Free From mature Cheddar and I thought I’d blog the results so others can see what this cheese is like on pizza. I’ll blog the other cheeses we use too in the future and then write a comparative post. I’m currently using Tesco Free From Cheese a lot as I’ve gone off Violife (I loved it but now find it too rubbery) so this is the only vegan hard cheese that I can pick up locally. The main reason this isn’t a recipe post is because I didn’t make the pizza dough. If you want to make your own here is a recipe for vegan pizza dough. Since discovering that Napolina Pizza Bases are accidentally vegan (they do however contain palm oil and E471 but state that it is suitable for vegetarians so it is plant derived) I try to keep some in the cupboard for a quick meal. We also use bread, muffins and scone for pizza bases, but nothing beats a home made dough base. I spread pizza sauce (Pizza Express Passata is nice but you can easily make your own with tin tomatoes and herbs) over each base. Then we helped ourselves to our toppings. Rebecca prefers vegan pizza with no cheese as she’s so used to having it that way when eating out (except for at Pizza Hut and Zizzi). I topped my pizza with grated Tesco Free From Mature Cheddar, artichokes, mushrooms, plum tomatoes, olives and jalapenos, garnished with spinach and basil leaves and a sprinkle of black pepper. I cooked it in the oven for ten minutes. The cheese melted nicely. It smelt great and kept it’s colour (some vegan cheeses turn brown quickly when warmed). As expected from a free-from cheddar (and most cheddar actually), it didn’t go stretchy and stringy so this isn’t the cheese for when your wanting a perfect stringiness pizza texture (although a bonus of this is it makes it easier to cut and eat). However, it tasted great and I’m definitely happy to continue using Tesco Free From Mature Cheddar on our pizza when I haven’t been organised enough to do an online shop (read: most of the time). I can’t wait see how other vegan cheeses melt on pizza. I should make a margarita as well as a vegetable pizza from now on so we can compare the cheese “meltiness” (a technical term) more easily. I have a long list of cheeses that we’ve used in the past and have heard about and want to try but if there’s a vegan cheese you think I should try (or make) please let me know. Also, has anyone found a good frozen vegan pizza? We’ve tried VBites Cheezly and Tomato but I find it darkens too quickly. What’s your favourite vegan pizza topping?